I had a terrific Jazz Night Out when I saw the Ibrahim Maalouf Kalthoum quintet open the Wexner Center 2016-17 jazz season on Thursday the 29th. As Maalouf explained at the outset, the Kalthoum program pays homage to legendary Egyptian singer Om Kalthoum, a profound inspiration to the French-Lebanese trumpeter. The performance was made up of one piece with several improvisational movements, replicating Kalthoum’s classical masterpieces. While the chorus and many of the movements delved into distinctly Middle Eastern motifs, the music incorporated jazzy grooves into a delightfully well-rounded whole. Maalouf’s tone and technique were breathtaking, displaying intricate skill and a passionate warmth simultaneously. Tenor saxophonist Rick Margitza was a worthy counterpart to Maalouf, delivering electric solo passages as well as pairing with bassist Scott Colley on resonating accompaniments. While pianist Frank Woeste also had his shining moments in the spotlight, his role as the “star of the rhythm section” left more of a mark on me, directing pulsing rhythms of infinite variety. Colley’s sound was incredibly expansive, which he fine tuned for backing and solo purposes, often to dramatic effect. Drummer Clarence Penn was a sheer force of nature, powering grooves that would change course in an instant and turning in thunderous solos. The combination of these five international talents, Maalouf and Woeste’s arrangements, and Maalouf’s friendly, humorous lead resulted in a night of exquisite worldly jazz, well suited to open another high-powered season at the Wex. Friday, October 7th, and Saturday, October 8th (10pm – midnight both nights): The Gabriel Alegria Afro-Peruvian Sextet at Natalie’s. The first of two jazzy two-night stands at Natalie’s in the next week (the other is also recommended) constitutes the return of these energetic purveyors of Afro-Peruvian jazz to Columbus. Trumpeter, composer, arranger, and Lima, Peru native Alegria founded the band in 2005 and tours with a lineup of players who are both great musicians and experienced educators. 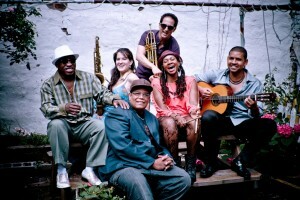 Through 11 years of recording (six albums and one DVD to date) and touring around the world, the sextet has been able to “develop the band’s patented blend of deep scholarship and playfulness into a touring experience that conveys a vast knowledge of the music and, perhaps more importantly, transmits black music from coastal Perú as a way of life to its audiences.” Alegria and his band of saxophonist Laura Andrea Leguia, guitarist Yuri Juarez, percussionist Freddy Lobaton, drummer Shirazette Tinnin, and bassist John Benitez will bring their joyful Afro-Peruvian music to one of Columbus’ finest listening rooms for two nights to remember! Get your tickets for Friday here and Saturday here. Sunday, October 9th (3 – 5pm): Emerald City Swing Orchestra featuring Ed Morrison at Northwest United Methodist Church, 5200 Riverside Drive. The ECSO, one of central Ohio’s finest swinging big bands, regularly seen at its monthly ballroom dance gig at the Emerald City Ballroom in Dublin on the last Friday of each month, has added a special event to their October schedule. This weekend they are playing this Northwest Columbus church’s second annual Cabaret event, bringing classic jazz for the audience’s dancing and listening pleasure. For this concert, they will be joined by renowned trumpeter and Columbus native trumpeter and bandleader Ed Morrison, in town from Santa Clara, California. For this special occasion, Morrison and the band will be performing selections from previous installments of their joint concert series “A Tribute To The Post-War Big Bands,” featuring the original arrangements of legends Doc Severinsen, Maynard Ferguson, Arturo Sandoval, and more – learn and here more here. Tickets are only $5 – click here for more details. Thursday, October 13th (6 – 9pm): Grand Piano Night featuring the Emmet Cohen Trio at The Refectory. As part of its Jazz Dinner Club series, this destination for fine dining and intimate live music is presenting a new run of Grand Piano Night concerts. The restaurant is bringing in a grand piano to its Choir Loft dining room and performance space for three nights of world-class jazz piano trios. First up is the NYC-based Emmet Cohen Trio, led by pianist, organist, composer, and educator Cohen. His young career includes a varied handful of recordings, international piano awards and performances in esteemed venues around the world. More details on the concert and the special menu are here. Cohen’s trio is followed by Columbus favorites the Bobby Floyd Trio (Friday the 14th) and the Dave DeWitt TRio (Saturday the 15th). As seating is limited to about 40 guests per event, spaces go very quickly and sellouts are likely, so make your phone reservation today by calling 614-451-9774.